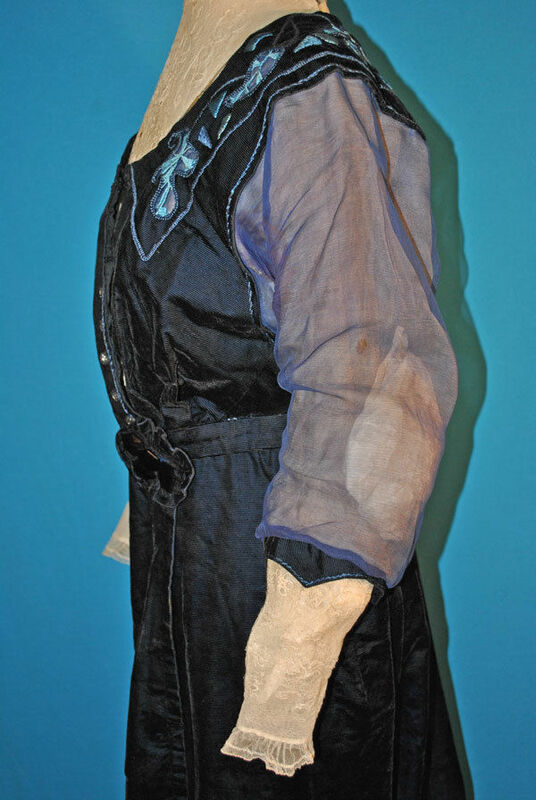 A regal c1915 midnight blue velvet 1 piece dress. The front has a white lace front and continuing into a high stand up lace neck collar and with long chiffon sleeves ending net lace wrist cuff. 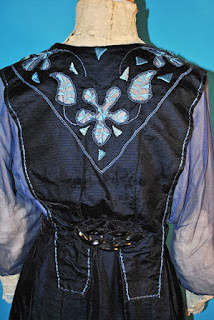 The front has a hook/eye closure which begins at the neckline and continues through the waist. No designer label. 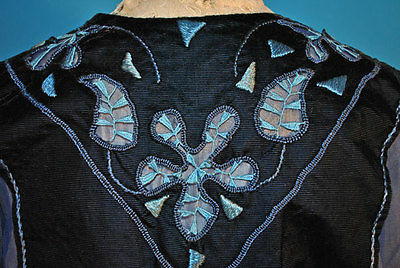 A wonderful blue hand embroidery in the arts and crafts design embellished the front and back that adds a timeless elegance! 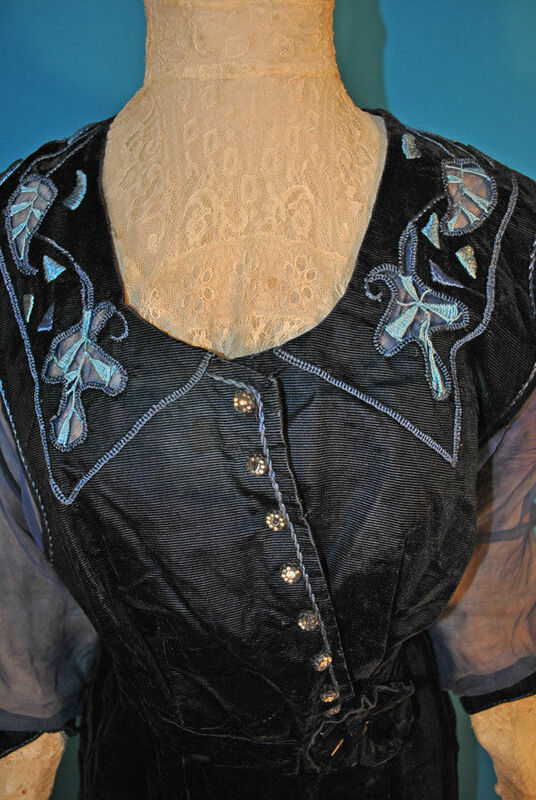 This dress has strong Arts and Crafts influence worked in the heavy velvet and the no pretense embroidered design elements motifs. The neckline front and sleeve cuffs are decorated with floral net lace. The neckline has small metal stays to keep the collar upright. 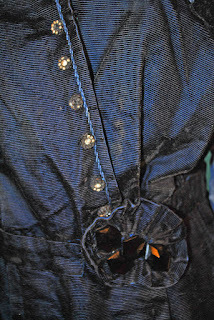 The bodice is lined with shredded silk and with 11 covered metal stays and has a front hook and eye closures. 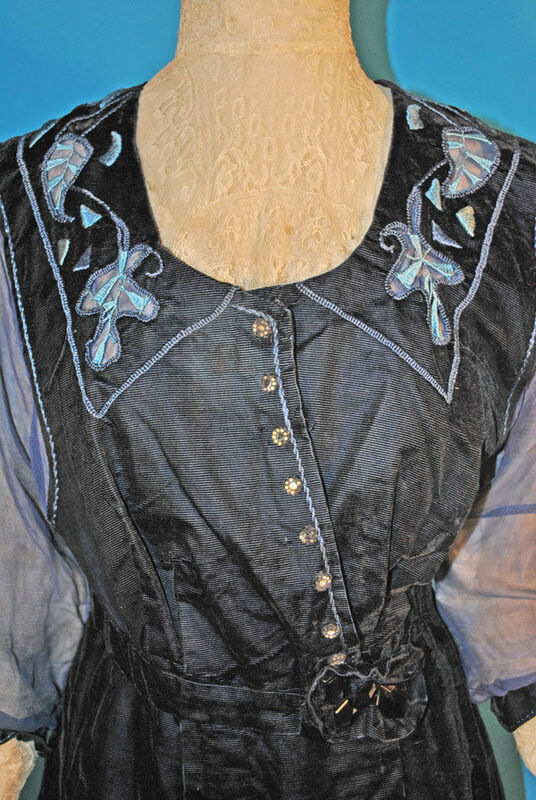 The bodice has 8 small black glass buttons that are missing many rhinestone inserts. At the front waist, there are 4 large faceted buttons sewn into a 4" blue velvet gathered floret, and at the back center waist are 7 elongated black glass buttons sewn into a blue velvet elongated floret. One of these buttons is broken in half but still attached. 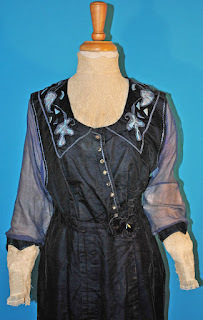 Sleeves have transparent blue chiffon material and accented with floral net lace cuffs. 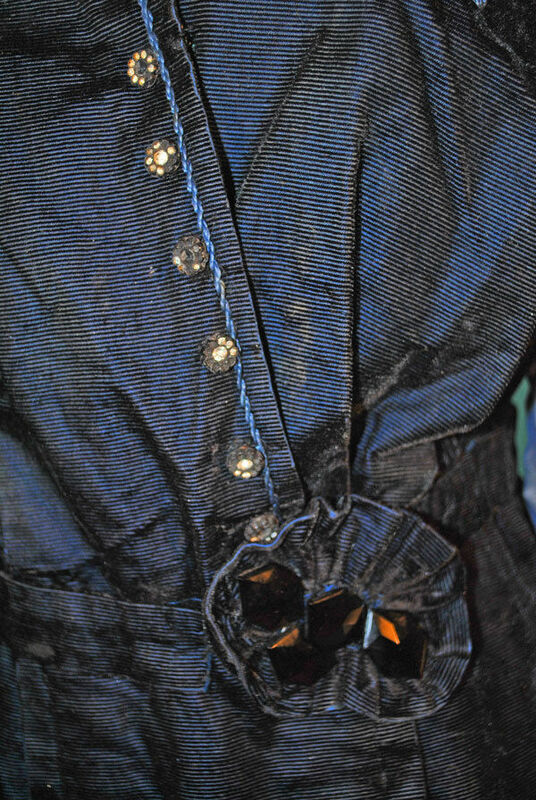 Condition: Condition: The outside midnight blue dress is in very good condition. 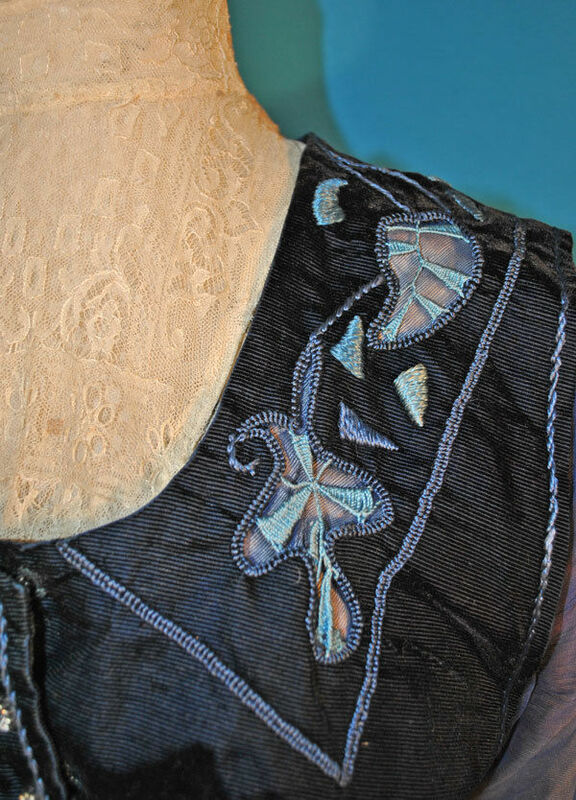 There is total splitting of silk inside lining of skirt and underarm shredding of bodice, no underarm staining. There is no underarm discoloration. Some small rips to chiffon at underarms and with a few oxidation brown spots. No stains or wear to velvet. At the hem line there is a oval sweep that was attached to the shredded lining, so it is hanging now, but can be reattached again. I have put tissue paper into the sleeves and that is what you see in the photos. A truly grand display dress/gown for study or display. 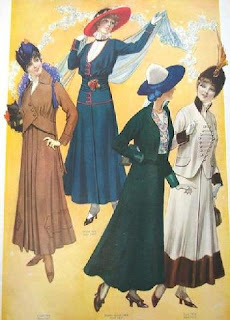 Antique clothing is for display/collecting and should not be worn. Measures: Bust 34", Waist 31", Front length from shoulder to hem 57", Sleeves 23". I think the seller is right on the money when it comes to what date this gorgeous dress is from. 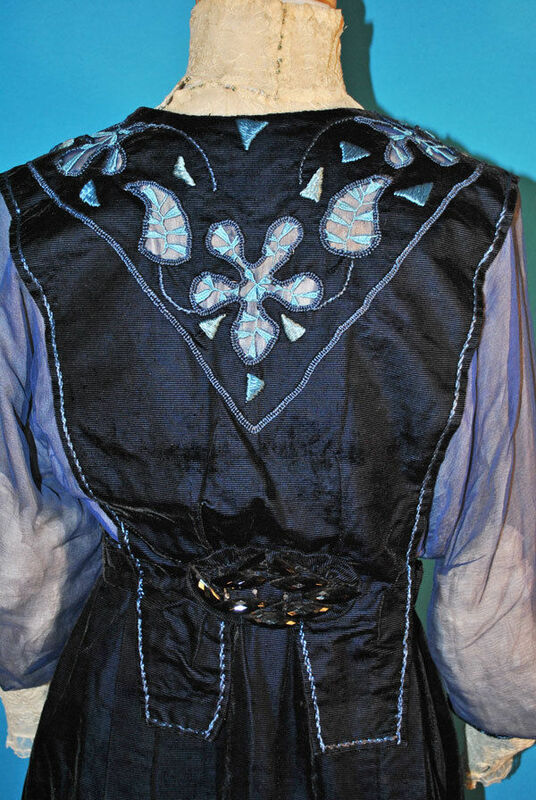 I just adore the details on the collar in the back. The high neck and lace long sleeves (look closely at the photos, you'll see it has the higher neck associated with some older fashions) were popular still with the older crowd but also came back into fashion briefly in the mid teens - as seen in the above fashion plate.